According to the Foundation for a Smokefree America, smoking is the single most preventable cause of death and disease causing more fatalities than cocaine, auto accidents, AIDS, alcohol, heroin, fire, suicide and homicide combined. Cigarettes are made up of tar, carbon monoxide, acetaldehyde, nitrosamines, nicotine and 4,000 different carcinogenic chemicals. Nicotine – a highly abused, highly toxic alkaloid found in tobacco products such as cigars, cigarettes and chewing tobacco – is metabolized into cotinine by the liver, which is then excreted in the urine. When an applicant applies for life insurance and provides a urine sample, that sample is tested for cotinine at the laboratory. 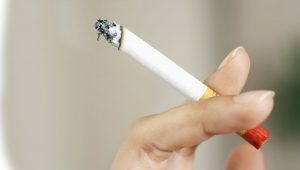 If the result is positive, the applicant will be rated as a smoker during the underwriting process and receive a much higher premium than a non-smoker. ExamOne research consistently shows that using the laboratory recommended cotinine threshold of .30 all but eliminates the possibility of a false positive test result. Smoking non-disclosure rates for applicants 18 to 34 years old are up from 25% in 2005 to 30% in 2015. The truth is that those types of explanations do not generally hold true. Indulging in a rare cigar or being around people who smoke is most likely not going to result in a positive cotinine result. A positive cotinine test is usually the result of someone who smokes, chews tobacco or wears a nicotine patch. There will always be myths about smoking, but a laboratory test can see through the smoke and get the real results.